We’d cut around the whole seal…We cut it right around the neck and then split the blubber off [inside] all around... We use a sharp knife. A woman’s ulaaq has a thousand everyday uses for sewing, cutting meat, and preparing food. 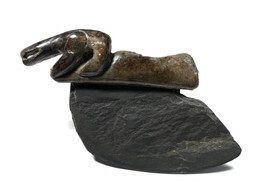 As Estelle Oozevaseuk described, a small ulaaq can be used to skin a whole seal from the inside to make an inflatable hunting float. This ancient woman’s knife from the Old Bering Sea period has a stone blade and a walrus ivory handle carved in the shape of a polar bear.